Big League Clew’s Road Trip Continues! This week he traveled from South Dakota all the way to Tennessee to take a look at two more Mid-Major contenders. Season’s greetings from America’s heartland, where the true sports fans live. Whether they follow college or professional sports, the sports fans from the Great Plains are some of the most die hard fans in the country. Win or Lose, these people follow their teams to the end, and boy do they love their hoops. My first stop this week was in the prairies of South Dakota, where I took closer look at the South Dakota State Jack Rabbits. Is Nate Wolters the next Jimmer Fredette? Welcome to Jackrabbit basketball people! 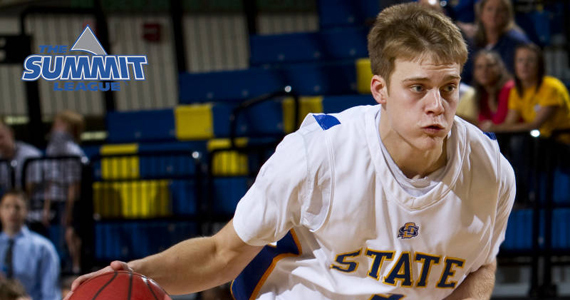 The SDSU Jackrabbits boast Junior PG Nate Wolters, one of the most talented point guards in the Summit League. While South Dakota State has, for the most part, been non-existent in the NBA scouting world, bur Wolters (who was voted Pre-Season 1st team All Conference), is doing his best to change the opinions of NBA scouts. Is he this year’s version of BYU’s Jimmer Fredette? Despite SDSU’s disappointing finish (19-12),Wolters put together some of the most well-rounded statistics in the nation during the 2010-2011 season. He averaged 19.5 ppg and 6.1 assists while shooting nearly 41% from three-point range. Coming from a non-traditional basketball school (and playing in the small conference Summit league), Wolters will likely have an uphill battle to prove he can play at an elite level of competition, but he is gaining a lot of national attention. Is this Team a Contender or a Pretender? One of the team’s bright spots this year has been their offense, where their ability to score points has them ranked 36th in the country. The rest of their game still needs a lot of work, but with Wolters contributing in both offense and defense, look for the Jackrabbits to contend for the summit league championship. If they do make it to the big dance, however, they probably won’t stick around for that long. I next hit the road and headed to another Mid-Major powerhouse. This time the road led to Tennessee, as I checked out the Sun Belt Conference and got a good look at Middle Tennessee State. LaRon Dendy and the Blue Raiders might have what it takes to make a splash this season. Is this Team a Contender or Pretender? 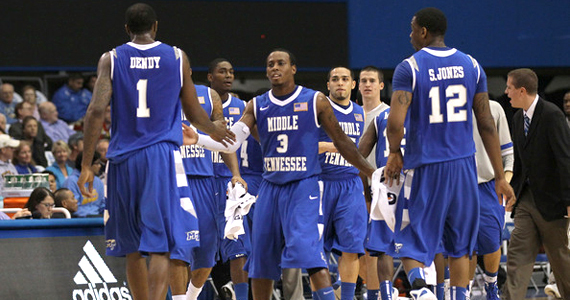 It has been a while since the Blue Raiders have been relevant in the realm of college basketball, and with conference play around the corner, it will be interesting to see how this team stacks up against their rivals (especially since other schools in the conference boast better rebounding programs). However, some of these smaller schools can be dangerous in conference play, so I wouldn’t overlook any of them if I were the Blue Raiders. Overall I think they should be able to hold their own in the conference and make a run to the big dance, where (depending on seeding) they could make a sweet 16 run.